Your Purpose articulates why you do what you do, why your business exists and what higher cause you serve. 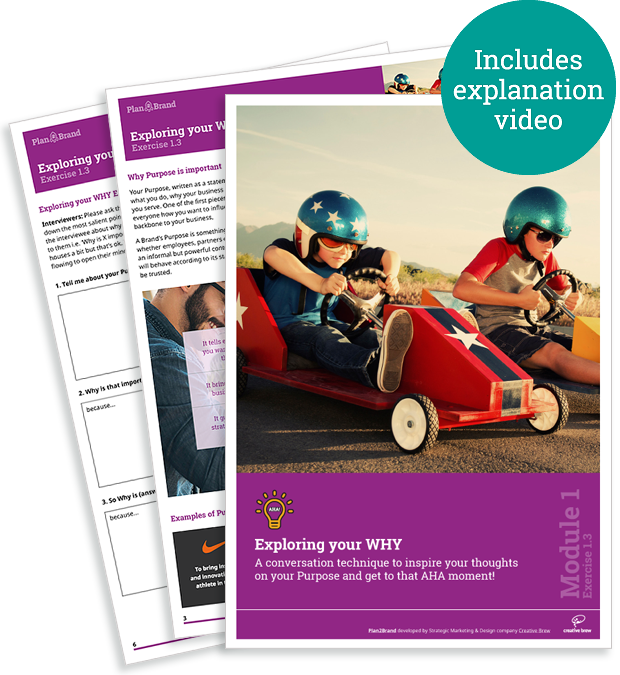 This FREE Brand Strategy Exercise & explanatory video aims to help your thoughts in iterating those ‘AHA’ moments that could clinch the answer to your Purpose. Written as a statement, it’s one of the first pieces of your brand DNA as it tells everyone how you want to influence the World. The one thing that truly inspiring and leading brands have in common is the pursuit of Purpose alongside the pursuit of profits. And driven faithfully and actively over time, brands with Purpose enjoy increased employee engagement, customer loyalty and sales. Shout a friend or partner to a coffee, because you need someone to be your interviewer or persistent interrogator! Have a go at writing your Purpose statement, which you can act on when making strategic decisions and begin to weave into your marketing communications.